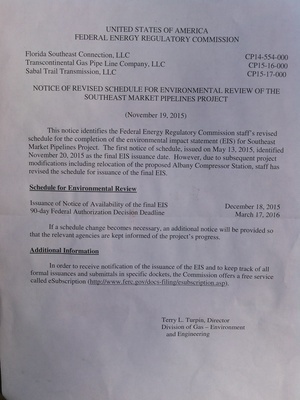 Three weeks after the date on the letter, I got this schedule notice from FERC, saying they plan to issue the final Environmental Impact Statement 18 December 2015, and they plan to rubberstamp the permit 17 March 2016, for Sabal Trail, Transco, and Florida Southeast Connection. So the opposition has made FERC slip the schedule a month. This letter does mention a move for the Albany Compressor Station, but it looks to me like it’s referring to the previous site relocation. This notice identifies the Federal Energy Regulatory Commission staff’s revised schedule for the completion of the environmental impact statement (EIS) for Southeast Market Pipelines Project. The first notice of schedule, issued on May 13, 2015, identified November 20, 2015 as the final EIS issuance date, However, due to subsequent project modifications including relocation of the proposed Albany Compressor Station, staff has revised the schedule for issuance of the final EIS. If a schedule change becomes necessary, an additional notice will be provided so that the relevant agencies are kept informed of the project’s progress. In order to receive notification of the issuance of the EIS and to keep track of all formal issuances and submittals in specific dockets, the Commission offers a free service called eSubscription (http://www.ferc.gov/docs-filing/esubscription.asp).